This expression links a pin from the puppet tool to several layers, such that all these layers influence the movement of the pin. This is like connecting the pin with rubber bands to all these layers. With a weight you can control the influence of each individual layer (the less weight, the softer is the rubber band for this layer). This is like a simple form of weight painting used for skinning characters in 3d applications. 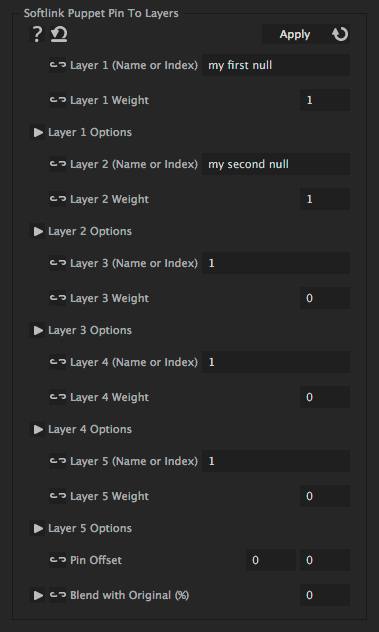 You can also set a time delay for each individual layer to create the impression of an even more elastic connection to this layer. Name or index of the first layer to which the puppet pin should be connected. The higher this value, the more influence this layer has on the pin. for 10, for example, the pin reacts with a delay of 10 frames to each movement of the layer. Offset, in case the pin should not be linked to the anchor point of the layer but to another point in the layer space. Moves the link in composition space. For [100,0], for example, the pin is always 100 pixels right of the anchor point of the layer. In contrast to the Layer Space Offset, the Comp Space Offset is not affected by rotation or scale of the layer that the pin is linked to. For [100,0], for example, the pin is always 100 pixels right of the normal position.